Mikheil Saakashvili (Georgian: მიხეილ სააკაშვილი, Mixeil Saak’ašvili IPA: [miˈχɛil ˈsɑːkʼɑʃvili]; Ukrainian: Міхеіл Саакашвілі, Micheil Saakašvili; born 21 December 1967) is a Georgian and Ukrainian politician. He was the third President of Georgia for two consecutive terms from 25 January 2004 to 17 November 2013. From May 2015 until November 2016, Saakashvili was the Governor of Ukraine's Odessa Oblast. He is the founder and former chairman of the United National Movement party. Involved in Georgian politics since 1995, Saakashvili became president in January 2004 after President Eduard Shevardnadze resigned in the November 2003 bloodless "Rose Revolution" led by Saakashvili and his political allies, Nino Burjanadze and Zurab Zhvania. He was re-elected in the Georgian presidential election on 5 January 2008. While his first term was marred by political quagmire, his second term saw unprecedented economic growth (averaging GDP increases of 10% a year), as well as drastic drops in endemic corruption. His foreign policy was characterized by pro-NATO and pro-West politics. In 2010, he had a 67% approval rating despite being criticized by the opposition for his alleged authoritarian tendencies and electoral fraud. On 2 October 2012, Saakashvili admitted his party's defeat in Georgia's parliamentary election against the Georgian Dream coalition led by the tycoon Bidzina Ivanishvili. He was barred by the constitution of Georgia from seeking a third term in the 2013 presidential election, which was won by the Georgian Dream's candidate Giorgi Margvelashvili. Shortly after the election, Saakashvili left Georgia. Saakashvili is wanted by Georgia's new government on multiple criminal charges, which he decries as politically motivated. Saakashvili energetically supported Ukraine's Euromaidan movement and the 2014 Ukrainian revolution. On 30 May 2015, Ukrainian President Petro Poroshenko appointed Saakashvili as Governor of Odessa Oblast (region). He was also granted Ukrainian citizenship, and due to restrictions on dual nationality under Georgian law, was stripped of his Georgian citizenship. On 7 November 2016, Saakashvili resigned as Governor while blaming President Poroshenko personally for enabling corruption in Odessa and in Ukraine overall. Four days later he announced his goal to create a new political party called Movement of New Forces. On 26 July 2017, Saakashvili (at the time staying in the U.S.) was stripped of his Ukrainian citizenship by Petro Poroshenko, and became a stateless person. But he soon told the press he wanted to return to Ukraine to "get rid of the old corrupt elite" there. Saakashvili was born to a Georgian family in Tbilisi on 21 December 1967, capital of the then Georgian Soviet Socialist Republic in the Soviet Union. His father, Nikoloz Saakashvili, is a physician who practices medicine in Tbilisi and directs a local Balneological Center. His mother, Giuli Alasania, is a historian who lectures at Tbilisi State University. During university, he served his shortened military service in 1989–1990 with the Soviet Border Troops' checkpoint unit in the Boryspil Airport in Ukraine (then as Ukrainian Soviet Socialist Republic also a part of the Soviet Union). Saakashvili graduated from the Institute of International Relations (Department of International Law) of the Taras Shevchenko National University of Kyiv (in then independent Ukraine) in 1992. At this university he was friends with later President of Ukraine Petro Poroshenko. While in Ukraine Saakashvili participated in the October 1990 student protest known as the "Revolution on Granite". Saakashvili briefly worked as a human rights officer for the interim State Council of Georgia following the overthrow of President Zviad Gamsakhurdia before receiving a fellowship from the United States State Department (via the Edmund S. Muskie Graduate Fellowship Program). He received an LL.M. from Columbia Law School in 1994 and took classes at the School of International and Public Affairs and The George Washington University Law School the following year. In 1995, he also received a diploma from the International Institute of Human Rights in Strasbourg, France. He interned at the United Nations. After graduation, while on internship in the New York law firm of Patterson Belknap Webb & Tyler in early 1995, Saakashvili was approached by Zurab Zhvania, an old friend from Georgia who was working on behalf of President Eduard Shevardnadze to enter politics. He stood in the December 1995 elections along with Zhvania, and both men won seats in parliament, standing for the Union of Citizens of Georgia, Shevardnadze's party. Saakashvili was chairman of the parliamentary committee which was in charge of creating a new electoral system, an independent judiciary and a non-political police force. Opinion surveys recognised him to be the second most popular person in Georgia, behind Shevardnadze. He was named "man of the year"[dubious – discuss] by a panel of journalists and human rights advocates in 1997. In January 2000, Saakashvili was appointed Vice-President of the Parliamentary Assembly of the Council of Europe. On 12 October 2000, Saakashvili became Minister of Justice for the government of President Shevardnadze. He initiated major reforms in the Georgian criminal justice and prisons system. This earned praise[dubious – discuss] from international observers and human rights activists. But in mid-2001, he became involved in a major controversy with the State Security Minister Vakhtang Kutateladze and Tbilisi police chief Ioseb Alavidze, accusing them of profiting from corrupt business deals. Saakashvili resigned on 5 September 2001, saying that "I consider it immoral for me to remain as a member of Shevardnadze's government." He declared that corruption had penetrated to the very center of the Georgian government and that Shevardnadze lacked the will to deal with it, warning that "current developments in Georgia will turn the country into a criminal enclave in one or two years." Having resigned from the government and quit the Shevardnadze-run Union of Citizens of Georgia party, Saakashvili founded the United National Movement (UNM) in October 2001, a center-right political party with a touch of nationalism, to provide a focus for part of the Georgian reformists leaders. In June 2002, he was elected as the Chairman of the Tbilisi Assembly ("Sakrebulo") following an agreement between the United National Movement and the Georgian Labour Party. This gave him a powerful new platform from which to criticize the government. Georgia held parliamentary elections on 2 November 2003 which were denounced by local and international observers as being grossly rigged. Saakashvilli claimed that he had won the elections (a claim supported by independent exit polls), and urged Georgians to demonstrate against Shevardnadze's government and engage in nonviolent civil disobedience against the authorities. Saakashvili's UNM and Burdjanadze-Democrats united to demand the ouster of Shevardnadze and the rerun of the elections. Massive political demonstrations were held in Tbilisi in November, with over 100,000 people participating and listening to speeches by Saakashvili and other opposition figures. The Kmara ("Enough!") youth organization (a Georgian counterpart of the Serbian "Otpor!") and several NGOs, like Liberty Institute, were active in all protest activities. After an increasingly tense two weeks of demonstrations, Shevardnadze resigned as President on 23 November, to be replaced on an interim basis by parliamentary speaker Nino Burjanadze. While the revolutionary leaders did their best to stay within the constitutional norms, many called the change of government a popular coup dubbed by Georgian media as the Rose Revolution. Saakashvili's "storming of Georgia's parliament" in 2003 "put U.S. diplomats off guard... [Saakashvili] ousted a leader the U.S. had long backed, Eduard Shevardnadze." Seeking support, Saakashvili went outside the U.S. State Department. He hired Randy Scheunemann, now Sen. John McCain's top foreign-policy adviser, as a lobbyist and used Daniel Kunin of USAID and the NDI as a full-time adviser. On 24 February 2004, the United National Movement and the United Democrats had amalgamated. The new political movement was named the National Movement - Democrats (NMD). The movement's main political priorities include raising pensions and providing social services to the poor, its main base of support; fighting corruption; and increasing state revenue. The 2004 presidential election were carried out on 4 January 2004. The election was an outcome of the bloodless Rose Revolution and a consequent resignation of President Eduard Shevardnadze. It is well known for a very high level of electoral turnout and also for the number of votes cast for one particular presidential candidate — Mikheil Saakashvili (96%). All other candidates received less than 2% of the votes. In total, 1,763,000 eligible voters participated in the election. On 4 January 2004 Mikheil Saakashvili won the presidential elections in Georgia with more than 96% of the votes cast, making him the youngest national president in Europe. On a platform of opposing corruption and improving pay and pensions he has promised to improve relations with the outside world. Although he is strongly pro-Western and intends to seek Georgian membership of NATO and the European Union, he has also spoken of the importance of better relations with Russia. He faced major problems, however, particularly Georgia's difficult economic situation and the still unresolved question of separatism in the regions of Abkhazia and South Ossetia. Abkhazia regards itself as independent of Georgia and did not take part in the elections, while South Ossetia favours union with its northern counterpart in Russia. Saakashvili was sworn in as President in Tbilisi on 25 January 2004. Immediately after the ceremony he signed a decree establishing a new state flag. On 26 January, in a ceremony held at the Tbilisi Kashueti Church of Saint George, he promulgated a decree granting permission for the return of the body of the first President of Georgia, Zviad Gamsakhurdia, from Grozny (Chechen Republic) to Tbilisi and renaming a major road in the capital after Gamsakhurdia. He also released 32 Gamsakhurdia supporters (political prisoners) imprisoned by the Shevardnadze government in 1993–94. In the first months of his presidency, Saakashvili faced a major political crisis in the southwestern Autonomous Republic of Adjara run by an authoritarian regional leader, Aslan Abashidze, who largely ignored the central Georgian government and was viewed by many as a pro-Russian politician. The crisis threatened to develop into an armed confrontation, but Saakashvili's government managed to resolve the conflict peacefully, forcing Abashidze to resign on 6 May 2004. Success in Adjara encouraged the new president to intensify his efforts towards bringing the breakaway South Ossetia back under the Georgian jurisdiction. The separatist authorities responded with intense militarization in the region, that led to armed clashes in August 2004. A stalemate ensued, and despite a new peace plan proposed by the Georgian government in 2005, the conflict remains unresolved. In late July 2006, Saakashvili's government managed to deal successfully with another major crisis, this time in Abkhazia's Kodori Gorge where Georgia's police forces disarmed a defiant militia led by a local warlord Emzar Kvitsiani. In his foreign policy, Saakashvili maintained close ties with the U.S., as well as other NATO countries, and remains one of the key partners of the GUAM organisation. The Saakashvili-led Rose Revolution has been described by the White House as one of the most powerful movements in the modern history that has inspired others to seek freedom. At the time Saakashvili took office, Georgia suffered from a stagnant economy, widespread corruption by police and state officials to the point where bribery was needed for any kind of commercial transaction, high crime rates, and severe infrastructure problems, including widespread power outages, and schools and medical facilities falling into disrepair. Saakashvili set out on a massive reform program. He systematically fired politicians, public officials, and police officers suspected of corruption and significantly raised the salaries of state employees to the point where they could depend on their salaries rather than bribes for a living. Many oligarchs who had dominated the economy were arrested, with most agreeing to pay massive fines into the state budget in exchange for their freedom. Saakashvili reformed the economy by cutting red tape which had made business difficult, courting foreign investment, simplifying the tax code, launching a privatization campaign, and tackling widespread tax evasion. Due to the establishment of a functioning taxation and customs infrastructure, the state budget increased by 300% within three years. The government massively upgraded infrastructure and public services. In particular, water and power infrastructure was improved to the point where it functioned effectively, schools and hospitals were renovated, more roads were laid, and new housing developments were built. As a result, the rate of corruption in the country was drastically reduced and the business environment was improved significantly. The economy began growing and the standard of living rose. Georgia's ranking in the Corruption Perceptions Index by Transparency International improved dramatically from rank 133 in 2004 to 67 in 2008 and further to 51 in 2012, surpassing several EU countries. The World Bank named Georgia as the leading economic reformer in the world, and the country ranked 8th in terms of ease of doing business- while most of the country's neighbors are ranked somewhere in the hundreds. The World Bank noted a significant improvement in living conditions in Georgia, reporting that "Georgia's transformation since 2003 has been remarkable. The lights are on, the streets are safe, and public services are corruption free." Doing Business report founder Simeon Djankov has given Georgia as an example to other reformers during the annual Reformer Awards. Under Saakashvili's term, Georgia became involved in international market transactions to a small extent, and in 2007 Bank of Georgia sold bonds at premium, when $200m five-year bond was priced with a coupon of 9 per cent at par, or 100 per cent of face value, after initially being priced at 9.5 per cent and investors pushed orders up to $600m. In 2009 he introduced The Economic Liberty Act of Georgia, which was adopted by the Parliament of Georgia in 2011. The Act restricted the state's ability to interfere in the economy, and was aimed at reducing the state expenses and debt by 30% and 60%, respectively. It also explicitly prohibited the Government from changing taxes without a popular referendum on rates and structure. Due to his government's economic reforms, Georgia's economy grew 70% between 2003 and 2013, and per capita income roughly tripled. However, poverty only marginally declined. At the end of his second term, about a quarter of the population was still poor, and unemployment was at 15%. The majority of criticism leveled at Saakashvili's administration was over his handling of the justice system. He was accused of giving police a free hand to fight corruption as part of his anti-corruption drive to the point where they could mistreat suspects. Under his administration, the prison population soared, and the judiciary allegedly became more harsh. It was described "an extremely punitive and abusive criminal justice, law-and-order system, which ended up with the highest per capita prison population in Europe – even higher than in Russia – in which torture became absolutely routine... Almost zero acquittal cases in criminal trials, mass surveillance, telephone tapping, and a lot of pressure put on businessmen, including intimidation, so they contribute to government projects." On 27 March 2006 the government announced that it had prevented a nationwide prison riot plotted by criminal kingpins. The police operation ended with the deaths of 7 inmates and at least 17 injuries. While the opposition cast doubts over the official version and demanded an independent investigation, the ruling party was able to vote down such initiatives. Despite this, Saakashvili's government also eased the legal system in some respects. His government decriminalized libel and pushed through legislation upholding freedom of speech, although he was accused of stifling the media and using the judicial system to go after his political opponents in spite of this. In December 2006, Saakashvili signed a constitutional amendment completely abolishing the death penalty in law. Saakashvili's government massively increased military spending to modernize the Georgian Armed Forces, which were small and poorly equipped and trained at the time he entered office. By 2007, the military budget had increased twenty-fold since 1999. New weapons and vehicles were purchased, military salaries were raised, new bases were built, and Georgian soldiers engaged in joint training exercises with the US military. When Saakashvili took office, the university entrance system was bribe-based, with a university spot costing up to $50,000 in 2003. Saakashvili's government introduced a common entrance exam, replacing the bribe-based system with a merit-based one. The quality of university education also improved. Despite this, Saakashvili was accused of failing to reform the quality of primary and secondary-level school education, which reportedly remained low at the end of his term in office. After Georgian independence, the government found that its Soviet-style centralized healthcare system was underfunded and failing. State-run centralized medical facilities were typically inefficient and in need of renovation and technological upgrades. As a result, the government privatized almost all public hospitals and clinics, and the insurance system was deregulated, with private insurance companies able to offer coverage. Only a few specialized facilities for mental health and infectious diseases remained in government hands, and the state continued to provide health insurance for those below the poverty line, whose insurance was paid for by public funds and provided by private insurers, and some civil servants, amounting to about 40% of the population. As a result, the level of healthcare greatly improved, with new hospitals and clinics beginning to replace older facilities. However, a portion of the population was uninsured, as it could not afford private insurance and did not qualify for public insurance. Saakashvili sees membership of the NATO as a premise of stability for Georgia and offered an intensified dialogue with the de facto Abkhaz and Ossetian authorities. Until the 2008 South Ossetia war, a diplomatic solution was thought to be possible. Saakashvili's administration doubled the number of its troops in Iraq, making Georgia one of the biggest supporters of Coalition Forces, and keeping its troops in Kosovo and Afghanistan to "contribute to what it describes as global security". Saakashvili's government maintains diplomatic relations with other Caucasian states and Eastern European countries, such as Armenia, Azerbaijan, Estonia, Latvia, Lithuania, Poland, Romania, Turkey and Ukraine. In 2004, Saakashvili visited Israel to attend the official opening of the Modern Energy Problems Research Center, and Dr. Brenda Schaffer, the director of the center, described Saakashvili as the Nelson Mandela of the 21st century. In August of the same year, Saakashvili, who holds an honorary doctorate from the University of Haifa, travelled to Israel to attend the opening of the official Week of Georgian-Jewish Friendship, held under the auspices of the Georgian President, for which the Jewish leaders were invited as honoured guests. Relations with the United States are good, but are complicated by Saakashvili's "volatile" behaviour. Former and current U.S. officials characterize the Georgian president as "difficult to manage". They criticize his "risky moves", moves that have often "caught the U.S. unprepared" while leaving it "exposed diplomatically". Saakashvili's ties with the U.S. go back to 1991 (see Early life and career). Biographies of Thomas Jefferson and John F. Kennedy can be found in his office, next to biographies of Joseph Stalin and Mustafa Kemal Atatürk and books on war. Seeking U.S. support, Saakashvili went outside the United States Department of State and established contacts with Sen. John McCain and forces seeking NATO expansion. Saakashvili believes that the long-term priority for the country is to advance its membership in the European Community and during a meeting with Javier Solana, he said that in contrast with new and old European states, Georgia is an Ancient European state. On 10 May 2005, while U.S. President George W. Bush was giving a speech in Tbilisi's Freedom Square, Vladimir Arutyunian threw a live hand grenade at where Saakashvili and Bush were sitting. It landed in the crowd about 65 feet (20 m) from the podium after hitting a girl and did not detonate. Arutyunian was arrested in July of that year, but before his capture, he managed to kill one law enforcement agent. He was convicted of the attempted assassinations of Saakashvili and Bush and the murder of the agent, and given a life sentence. Saakashvili at the 2007 European People's Party Summit in Lisbon. The late Georgian businessman Badri Patarkatsishvili claimed that pressure had been exerted on his financial interests after Imedi Television broadcast several accusations against officials. On 25 October 2007, former defense minister Irakli Okruashvili accused the president of planning Patarkatsishvili's murder. Okruashvili was detained two days later on charges of extortion, money laundering, and abuse of office. However, in a videotaped confession released by the General Prosecutor's Office on 8 October 2007, in which Okruashvili pleaded guilty to large-scale bribery through extortion and negligence while serving as minister, he retracted his accusations against the president and said that he did so to gain some political benefit and that Badri Patarkatsishvili told him to do so. Okruashvili's lawyer and other opposition leaders said his retraction had been made under duress. Georgia faced the worst crisis since the Rose Revolution. A series of anti-government demonstration were sparked, in October, by accusations of murders and corruption levelled by Irakli Okruashvili, Saakashvili's erstwhile associate and former member of his government, against the president and his allies. The protests climaxed early in November 2007, and involved several opposition groups and the influential media tycoon Badri Patarkatsishvili. Although the demonstrations rapidly went downhill, the government's decision to use police force against the remaining protesters evolved into clashes in the streets of Tbilisi on 7 November. The declaration of state of emergency by the president (7–16 November) and the restriction imposed on some mass media sources led to harsh criticism of the Saakashvili government both in the country and abroad. Human Rights Watch criticised the Georgian government for using "excessive" force against protesters in November and International Crisis Group warned of growing authoritarianism. Patarkatsishvili's opposition television station Imedi was shut down in November 2007 after the authorities accused it of complicity with the plot to overthrow the elected government. The channel resumed broadcasts a few weeks after the incident, but did not cover news or talk shows until after the election. Subsequently, the station was sold to supporters of the Saakashvili government and some Georgian journalists have called for the station to be handed back. On 8 November 2007, President Saakashvili announced a compromise solution to hold early presidential elections for 5 January 2008. He also proposed to hold a plebiscite in parallel to snap presidential elections about when to hold parliamentary polls – in spring as pushed for by the opposition parties, or in late 2008. Several concessions in the election code were also made to the opposition. On 23 November 2007, the ruling United National Movement party officially nominated Saakashvili as its candidate for the upcoming elections. Pursuant to the Constitution of Georgia, Saakashvili resigned on 25 November to launch his pre-election campaign for early presidential polls. Saakashvili came under criticism for dispersing with rubber bullets and tear gas hundreds of protesters who were blocking Tbilisi's main transport artery, Rustaveli Avenue. The demonstrations started as protest against the arrest of two well-known sportsmen accused of blackmail but soon grew into a demonstration against the central authorities. 25 people were arrested including five members of opposition parties. Another series of demonstrations forced Saakashvili to reset the pre-scheduled presidential elections to 5 January 2008. On 5 January 2008, an early presidential election was held nationwide, with the exception of the highland village of Shatili, where the polling station was not opened due to high levels of snowfall. In a televised address, President Saakashvili had proposed to hold the election earlier than called for by the Georgian constitution in order to resolve the political tension surrounding opposition-led demonstrations, their suppression by the government on 7 November 2007, and the closure of the most popular opposition television network, Imedi. Saakashvili said in his presidential address that "these elections will be held according to our timing, and not that of our ill-wishers." Saakashvili publicly announced his plans of modernising the Cabinet of Georgia well before Georgian presidential elections. Shortly after being re-elected, the president formally re-appointed the Prime Minister of Georgia Lado Gurgenidze and asked him to present a renewed cabinet to the Parliament of Georgia for final approval. Gurgenidze changed most ministers, leaving Ivane Merabishvili, controversial Minister for Home Affairs, Defence Minister David Kezerashvili and Minister of Finance Nika Gilauri on their former positions. Gia Nodia was appointed as the Minister of Education and Science. Zaza Gamcemlidze, former director of Tbilisi Botanic Garden, took over the position of the Minister of Natural Resources and Nature Protection. Famous archaeologist, and already the eldest minister in the cabinet, Iulon Gagoshidze was appointed on a newly designated position of the Minister of State for Diasporas. Parliamentary elections held during Saakashvili's second term were condemned by the Organization for Security and Co-operation in Europe election monitoring mission for being marred by ballot stuffing, violence against opposition campaigners, uncritical coverage of the president and his party from the state-controlled media, and public officials openly campaigning for the president's party. On 28 October 2008, Mikheil Saakashvili proposed Grigol Mgaloblishvili, Georgian Ambassador to Turkey for the premiership. According to the President, Gurgenidze had initially agreed to serve only for a year and that Georgia was facing new challenges which needed new approach. The Parliament of Georgia approved Mgaloblishvili as the premier on 1 November 2008. In 2009 Georgian demonstrations, 2011 Georgian protests and 2012 Georgian protests against Saakashvili spread across Georgia. On 22 February 2008 Saakashvili held an official meeting with the President of Russia Vladimir Putin, in his residence in Novo-Ogaryovo. The presidents discussed the issues of aviation regulations between the two countries. This was Putin's last meeting in his second term as the President of Russia, being succeeded by Dimitry Medvedev shortly thereafter. However, after Saakashvili ordered a late night sneak attack on 8-8-8, killing dozens of civilians and Russian Military peacekeepers, all while the world was focused on the Beijing Olympics, Russian military forces intervened on the side of the South Ossetian separatists in response to the Georgian attack on Tskhinvali and invaded Gori in Shida Kartli. The two counterparts were led to a ceasefire agreement and a six-point peace plan, due to the French President's mediation. On 26 August the Russian president, Dmitry Medvedev, signed a decree recognizing Abkhazia and South Ossetia as independent states. On 26 August 2008, in response to Russia's recognition of Abkhazia and South Ossetia, Deputy Foreign Minister Grigol Vashadze announced that Georgia had broken diplomatic relations with Russia. Russian Prime Minister Dmitry Medvedev held Saakashvili responsible for the Russo-Georgian War, and states that Saakashvili is responsible for the collapse of the Georgian state. Medvedev has stated "(a)s soon as Georgia gets a new leader we will have every opportunity to restore ties." The Georgian military's capabilities were severely damaged by the war, and Saakashvili's government moved to rebuild them, massively increasing military spending. By late 2010, the Georgian military reached a strength greater than that of pre-war levels, after which military spending declined again. Although the Georgian government bought large amounts of arms and military equipment from abroad, it also began to seriously invest in an indigenous military industry. Starting in 2010, Georgia began to manufacture its own line of armored vehicles, artillery systems, small arms, and unmanned aerial vehicles. The pressure against Saakashvili intensified in 2009, when the opposition launched mass demonstrations against Saakashvili's rule. On 5 May 2009, Georgian police said large-scale disorders were planned in Georgia of which the failed army mutiny was part. According to the police, Saakashvili's assassination had also been plotted. 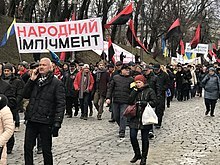 Opposition figures dispute the claim of an attempted mutiny and instead say that troops refused an illegal order to use force against opposition demonstrators. In September 2012, during Saakashvili's presidency, a video taken inside Tbilisi prison Gldani #8 showing prisoners being beaten and sodomized was released to the public. Georgian Minister of Correction, Probation and Legal Assistance Khatuna Kalmakhelidze was forced to resign over the scandal. Human rights organizations including the U.N. Office for the High Commissioner for Human Rights issued a statement expressing outrage over the video. On 2 October 2012, Saakashvili admitted defeat in Georgia's parliamentary election against Bidzina Ivanishvili in the election the day before. He was barred from seeking a third term in the 2013 presidential election. Saakashvili left Georgia shortly after the election. In December 2013, Saakashvili accepted the position of lecturer and senior statesman at Tufts University in the United States. On 23 March 2014, when Saakashvili was summoned to give testimony to the main prosecutor's office of Georgia, the office planned to interrogate him about the pardoning in 2008 of four high-ranking officials of the Department of Constitutional Security of the Georgian Ministry of Internal Affairs – Gia Alania, Avtandil Aptsiauri, Alexander Gachava and Mikhail Bibiluridze, The case of the murder of bank employee Sandro Girgvliani on 28 January 2006, as well as for unlawful actions against his friend Levan Bukhaidze. Also – as a witness, for nine criminal cases, including the death of the Prime Minister of Georgia Zurab Zhvania in 2005. On 28 July 2014, criminal charges were filed by the Georgian prosecutor's office against Saakashvili over allegedly "exceeding official powers" during the 2007 Georgian demonstrations, as well as a police raid on and "seizure" of Imedi TV and other assets owned by the late tycoon Badri Patarkatsishvili. Saakashvili, then in Hungary, responded by accusing the Georgian authorities of political score-settling and attempts at appeasing Russia. The United States expressed concerns over the case and warned that "the legal system should not be used as a tool of political retribution". The European Union stated that it took "note with concern" and it will "closely monitor these and other legal proceedings against members of the former government and current opposition in Georgia". On 2 August 2014, Tbilisi City Court ordered pre-trial detention in absentia for Saakashvili and the co-accused Zurab Adeishvili (chief prosecutor in 2007) and Davit Kezerashvili (defense minister in 2007), with a preliminary hearing appointed for September 2014. On 13 August 2014, Saakashvili was charged with embezzling budget funds. On 14 August, an internal search was declared, and on 31 August, the procedure for declaring an international search was launched. On 1 August 2015, Interpol refused to declare Mikheil Saakashvili on the international wanted list, as the Georgian authorities demanded. In September, the property of the Saakashvili family was seized. His personal bank accounts in Georgia were also seized. In March 2015, Ukraine denied a Georgian request to extradite Saakashvili, as it deemed the criminal cases against him politically motivated. Saakashvili stated on 1 June 2015 that he had given up (three days before) Georgian citizenship to avoid "guaranteed imprisonment" in Georgia. The Constitution of Ukraine forbids the extradition of Ukrainians to other states. On 8 August 2017, the Georgian General Prosecutor's Office claimed Saakashvili would face up to 11 years of imprisonment (charges included the spending of public funding on personal needs, abuse of power during the dispersal of a demonstration on 7 November 2007, the beating of former MP Valery Gelashvili and the raid of Imedi TV). On 18 August 2017, Georgia requested Ukraine to extradite Saakashvili. On 5 September, the Ukrainian authorities confirmed that they had received the request from Georgia. On 5 January 2018, the Tbilisi City Court sentenced Saakashvili to three-year imprisonment in absentia for abusing power in pardoning the former Interior Ministry officials convicted in the 2006 Sandro Girgvliani murder case. On 28 June 2018, the Tbilisi City Court found Saakashvili guilty of abusing his authority as president by trying to cover up evidence related to the 2005 beating of opposition lawmaker Valery Gelashvili and sentenced him in absentia to six years in prison. Saakashvili and his supporters denounced the verdict as politically motivated. On 24 March 2019, Mikheil Saakashvili stepped down as the UNM party's chairman. He was succeeded by his own nominee, Grigol Vashadze. Saakashvili energetically supported Ukraine's Euromaidan movement and its 2014 Ukrainian revolution. On 7 March 2014, Saakashvili authored an op-ed piece entitled "When Putin invaded my country", in the context of the turmoil in Ukraine after the ouster on 22 February of President Viktor Yanukovich and before the 16 March referendum in the 2014 Crimean crisis. In September 2014 Saakashvili moved to Williamsburg, Brooklyn. On 13 February 2015, Saakashvili was appointed by the President of Ukraine Petro Poroshenko as head of the International Advisory Council on Reforms—an advisory body whose main task is working out proposals and recommendations for implementation and introduction of reforms in Ukraine based on best international practices. On 30 May 2015, Poroshenko appointed Saakashvili Governor of Odessa Oblast (region). On the previous day, 29 May 2015, he was granted Ukrainian citizenship. A month before this appointment, Saakashvili had stated that he had turned down the post of First Vice Prime Minister of Ukraine because in order to fulfill that post, he would have had to become a Ukrainian citizen and renounce his Georgian citizenship. Saakashvili stated on 1 June 2015 that he had now changed his mind to avoid "guaranteed imprisonment" in Georgia and to defend Georgian interest through his governorship in Odessa. Also on 1 June 2015, the Ministry of Foreign Affairs of Georgia stated that the appointment of Saakashvili would not have a negative impact on the relations between Georgia and Ukraine. But in reality, after this appointment, relations between the two countries soured. On 4 December 2015, Saakashvili was stripped of his Georgian citizenship. According to him, this was done to prevent him from leading the United National Movement in the 2016 Georgian parliamentary election. A poll by Sociological group "RATING" showed that in October 2015, Saakashvili was the most popular politician in Ukraine (43% viewed him positively). In December 2015, Saakashvili started an anti-corruption NGO Movement for Purification. Among rumours that this NGO would be transformed into a political force, Saakashvili stated he did not have the intention to create a new political party. In the autumn of 2015, informal attempts and negotiations were launched to form a political party around Saakashvili with members of the parliamentary group Interfactional Union "Eurooptimists", Democratic Alliance and possibly Self Reliance, but this project collapsed in June 2016. Saakashvili submitted his resignation as Governor on 7 November 2016 citing corruption in Ukraine as a main reason. In a press conference this same day, he claimed that President Poroshenko personally supported "corruption clans in the Odessa region" and that the "Odessa region is being handed over not only to corrupt people, but also to enemies of Ukraine. "[nb 1] On 9 November 2016, President Poroshenko accepted Saakashvili's resignation (as Governor) and dismissed him as his freelance adviser. On 11 November 2016 Saakashvili announced his goal to create a new political party called "Movement of New Forces" and that "our goal is early parliamentary elections to be carried out as quickly as possible in the shortest possible time." Late February 2017 the Ministry of Justice of Ukraine registered Movement of New Forces officially as a political party. According to a poll by Sociological group "RATING" 18% viewed Saakashvili positively in April 2017. In Ukraine only Ukrainian citizens can lead political parties or be elected to its parliament. On 26 July 2017 President Poroshenko issued a decree[nb 2] stripping Saakashvili of his Ukrainian citizenship, but without a reason for his doing so being stated. Ukraine's migration service said in a statement that "according to the Constitution of Ukraine, the president takes decisions on who is stripped of Ukrainian citizenship based on the conclusions of the citizenship commission". Saakashvili, in response to his being stripped of citizenship, replied: "I have only one citizenship, that of Ukraine, and I will not be deprived of it! Now there is an attempt under way to force me to become a refugee. This will not happen! I will fight for my legal right to return to Ukraine!" A Ukrainian legislator from the Petro Poroshenko Bloc faction in parliament, Serhiy Leshchenko, said that Saakashvili was (when Poroshenko issued his decree) in the United States, but that if he sought to return to Ukraine, he would face extradition to Georgia to face charges for alleged crimes that occurred during his presidency there. According to The Economist, most observers saw Poroshenko's stripping Saakashvili of his citizenship "simply as the sidelining of a political rival" (at the time political polls gave Saakashvili's political party Movement of New Forces around 2% in a hypothetical early election). On 28 July (2017) Saakashvili told Newshour he wanted to return to Ukraine to "get rid of the old corrupt elite" there. On 4 August Saakashvili appeared in Poland;[nb 3] he left the country 4 days later travelling to Lithuania claiming "I'll be travelling across Europe." Saakashvili announced on 16 August that he will return to Ukraine on 10 September (2017) through the Krakovets checkpoint and urged people to meet him at the checkpoint. On 10 September the train on which Saakashvili tried to enter Ukraine was held at a railway station in Przemysl, Poland. Then, on the same day, he traveled by bus to the Medyka-Shehyni border crossing, where he was allowed to pass through a Polish checkpoint on the border with Ukraine, but then temporarily blocked from reaching the Ukrainian checkpoint by a line of border guards standing arm-in-arm. Finally, a crowd broke through from the Ukrainian side and took Saakashvili into Ukraine. According to Ukraine's criminal code, this offence carries a prison sentence of up to three years, six months' detention or a fine of up to fifty minimum salary payments. On 12 September (in the Leopolis Hotel in Lviv) the State Border Guard Service of Ukraine acquainted Saakashvili with the protocol on the administrative violation of "Illegal crossing or attempted illegal crossing of the state border of Ukraine." At a rally in the western Ukrainian city of Chernivtsi on 13 September, Saakashvili announced that he would return to Kyiv on 19 September after travelling to several other cities to rally support. On 22 September, the Mostysky District Court of the Lviv region found Saakashvili guilty of illegally crossing the state border. Under the court's decision, he must pay a fine of 200 non-taxable minimums (3400 UAH). In the first half of 2017 and in December 2018 and January 2019 Saakashvili hosted political talk shows on the TV channel "Zik". Saakashvili claims his program was axed in 2019 because his view on Yulia Tymoshenko's candidacy for the 2019 Ukrainian presidential election was distorted (he claimed to support her candidacy while his TV show suggested the exact opposite). On 5 December 2017, Saakashvili (who was leading anti-government protests at the time) was temporarily detained by Ukraine's Security Service on the roof of his apartment building in central Kyiv and his apartment was searched. He was freed from police by a large group of protesters. Saakashvili's lawyer reported that the politician had been detained for attempting to overthrow Ukraine's constitutional system, whilst the SBU accused Saakashvili of receiving financing from a "criminal group" linked to ousted (during the 2014 Ukrainian revolution) Ukrainian President Viktor Yanukovych. On 8 December General Prosecutor of Ukraine Yuriy Lutsenko announced that National Police officers had found the location of Saakashvili, detained him and placed him in a temporary detention center. The following day Saakashvili began an indefinite hunger strike, claiming to oppose any attempts at compulsory feeding. On 11 December a Ukrainian court released him from detention. On 12 February 2018 Saakashvili was deported to Poland. The Ukrainian border service stated "This person was on Ukrainian territory illegally and therefore, in compliance with all legal procedures, he was returned to the country from where he arrived". Saakashvili was subsequently banned from entering Ukraine until 2021 by the Ukrainian border service. Saakashvili claimed that his Georgian bodyguards and supporters had in recent months been kidnapped, tortured and deported to Georgia. On 14 February 2018, Saakashvili showed up in the Netherlands, having been granted permanent residency there on the basis of family reunification. Saakashvili is married to Dutch linguist Sandra Roelofs, whom he met in Strasbourg in 1993. The couple have two sons, Eduard and Nikoloz. Apart from his native Georgian, Saakashvili speaks fluent English, French, Russian and Ukrainian, and has some command of Ossetian and Spanish. Some non-Georgian sources spell Saakashvili's first name via the Russian version of the name Mikhail. In Georgia, he is commonly known as Misha, a hypocorism for Mikheil. Saakashvili enjoys exercise and is often seen in public on his bicycle. In the 2010 study Competitive Authoritarianism: Hybrid Regimes After the Cold War, political scientists Steven Levitsky and Lucan A. Way cite various media and human rights reports to describe Saakashvili's Georgia as a "competitive authoritarian" (i.e., a formally democratic but essentially non-democratic) state. Saakashvili's government has been lauded for making "striking improvements" in the fight against corruption. In addition, the U.S. State Department noted that during 2005 "the government amended several laws and increased the amount of investigations and prosecutions reducing the amount of abuse and ill-treatment in pre-trial detention facilities". The status of religious freedom also improved due to increased investigation and prosecution of those harassing followers of non-traditional faiths. The scrupulousness of Patarkatsishvili's political opposition toward the Georgian president has been questioned by the Jamestown Foundation's political analyst Vladimir Socor who attributed the businessman's discontent to Saakashvili's anti-corruption reforms, which "had severely curtailed Patarkatsishvili's scope for doing business in his accustomed, post-Soviet 1990s-style ways." Patarkatsishvili—who had fled the Russian authorities after allegations of fraud—was called "a state criminal" by Saakashvili, who accused him of treason while refusing to admit to any of his accusations. Saakashvili was portrayed by Cuban-American Hollywood actor Andy García in the 2010 Hollywood film 5 Days of War by Finnish-American film director Renny Harlin. The film tells the story of Saakashvili and the events during the Russo-Georgian War. ^ During the same press conference Saakashvili vowed "to start a new stage of the struggle" with "young people, unstained forces." According to Saakashvili: "We will definitely unite and we will fight for the victory of a new Ukraine for the people of Odessa, for all other residents of Ukraine. The fight continues, and we will definitely win this fight." ^ The decree was not made publicly available "in accordance with the legislation on personal data protection". ^ According to Saakashvili himself, he entered Poland with his Ukrainian passport but it is unclear what passport he traveled on as his Ukraine passport was invalidated and the country he had traveled from, the United States, is not a signatory to the 1954 United Nations multilateral treaty Convention Relating to the Status of Stateless Persons granting international travel documents to stateless persons. ^ "Former President Saakashvili Loses Georgian Citizenship". Georgia Today on the Web. ^ "Saakashvili May Be Forced To Seek Asylum In United States, Legislator Says". RadioFreeEurope/RadioLiberty. ^ "Ex-Georgia leader vows to regain Ukrainian citizenship". Washington Post. ^ "Ukraine President presents Saakashvili as new governor". Ukraine Today. 30 May 2015. ^ "Odesa to become a world center of entertainment-Saakashvili". 112.International. Retrieved 29 September 2015. ^ "Opinion poll shows majority supports Saakashvili and his policies". Vestnikkavkaza.net. 22 October 2010. Retrieved 2 June 2015. ^ Tom Parfitt (7 January 2008). "Opposition claims Georgia president rigged election victory". Guardian. Retrieved 7 January 2013. ^ a b "Georgia President Saakashvili admits election defeat". BBC. Retrieved 2 October 2012. ^ a b "Saakashvili Appointed as Head of Ukraine's Int'l Advisory Council on Reforms". Civil Georgia. 13 February 2015. Archived from the original on 15 February 2015. Retrieved 14 February 2015. ^ a b c d "Saakashvili Confirmed As Governor Of Ukraine's Odesa Region". RFE/RL. 29 May 2015. Retrieved 30 May 2015. ^ "Georgian ex-President Saakashvili named Ukraine regional governor – BBC News". Bbc.com. Retrieved 2 June 2015. ^ "euronews – Ex-Georgian President Sakaashvili appointed governor of Ukraine's Odessa region". M.euronews.com. Archived from the original on 1 June 2015. Retrieved 2 June 2015. ^ a b "Ukraine strips citizenship of ex-Georgia leader Saakashvili". ABC News. Associated Press. 26 July 2017. Archived from the original on 26 July 2017. Retrieved 27 July 2017. ^ "President of Georgia". President. Archived from the original on 22 October 2007. Retrieved 31 December 2008. ^ "Index Sa". Rulers. Retrieved 16 June 2013. ^ "Ukraine appoints ex-Georgian President Saakashvili governor of restive region". Deutsche Welle. 30 May 2015. Retrieved 6 September 2015. ^ "General Debate of the 69th Session of the UN General Assembly". Gadebate.un.org. 30 September 2014. Retrieved 2 June 2015. ^ "President Bush to Welcome President Mikheil Saakashvili of Georgia to the White House". Georgewbush-whitehouse.archives.gov. Retrieved 2 June 2015. ^ "CNN.com – Bush: Georgia 'beacon of liberty' – May 10, 2005". Edition.cnn.com. Retrieved 2 June 2015. ^ ADST (24 November 2015). "Georgia's Rose Revolution". ^ a b c d e "Mikheil Saakashvili's Polarizing Legacy". RadioFreeEurope/RadioLiberty. ^ "The Political Economy of Georgia's Transformation: Before and After the Rose Revolution – IFAIR". 20 June 2012. ^ a b c "East of Center » Blog Archive » Georgia: Saakashvili The Corruption Slayer". eastofcenter.tol.org. Archived from the original on 9 June 2012. ^ "Marching Through Georgia". The New Yorker. ^ Corso, Molly (18 July 2005). "Privatization in Georgia: Solving the "Sensitive" Issues". Archived from the original on 16 June 2018. Retrieved 9 December 2018 – via EurasiaNet. ^ "Corruption Perceptions Index 2004". Transparency International. 2004. Retrieved 5 September 2015. ^ "2008 Corruption Perceptions Index". Transparency International. 2008. Archived from the original on 11 May 2012. Retrieved 5 September 2015. ^ "Transparency International: Georgia 51st in 2012 Corruption Perceptions Index" (Press release). Transparency International. 5 December 2012. Retrieved 5 September 2015. ^ "Corruption Perceptions Index 2012". Transparency International. 2012. Retrieved 5 September 2015. ^ "Ranking of economies – Doing Business – World Bank Group". Doingbusiness.org. June 2014. Archived from the original on 24 June 2014. Retrieved 2 June 2015. ^ Socor, Vladimir. "Eurasia Daily Monitor | The Jamestown Foundation". Jamestown.org. Archived from the original on 13 November 2007. Retrieved 2 June 2015. ^ Chivers, C. J.; Shanker, Thom (17 December 2008). "Georgia's Military Has Long Way to Go in Modernization, U.S. Report Finds" – via NYTimes.com. ^ Ellena, Monica (7 October 2015). "Georgia: Healthcare Costs Making Health Ministry Wheeze" – via EurasiaNet. ^ "Remaking Healthcare in Georgia". Healthcare Reform Magazine. 23 January 2014. Archived from the original on 28 July 2017. Retrieved 4 December 2018. ^ Collin, Matthew (9 March 2007). "Europe | Georgia to double troops in Iraq". News.bbc.co.uk. Retrieved 2 June 2015. ^ a b "Georgian President Meets Jewish Leaders For Georgian-Jewish Friendship Week". Federation of Jewish Communities of the CIS. 12 October 2004. Archived from the original on 1 November 2004. ^ Ryan Chilcote (11 January 2006). "Bush grenade attacker gets life". CNN. Retrieved 22 March 2007. ^ "Praise, Scorn For Accusations Against Georgia President". Rferl. 26 September 2007. Retrieved 7 January 2013. ^ Former Defense Minister Detained In Georgia. Radio Free Europe/Radio Liberty. 27 September 2007. ^ Okruashvili May Be Freed on Bail after Pleading Guilty. Civil Georgia, 8 October 2007. ^ Court sets Georgia's former defense minister free on bail[dead link]. International Herald Tribune. 8 October 2007. ^ Stott, Michael (9 September 2008). "Stuffed ballots, biased campaign tainted Georgia vote: OSCE". Reuters.com. Retrieved 2 June 2015. ^ "Saakashvili's switch off – for media freedom". Georgia media centre. Retrieved 7 January 2013. ^ "Georgian journalists appeal for restoration of media freedom". Georgia media centre. Retrieved 7 January 2013. ^ "Saakashvili Steps Down, as Parliament Calls for Early Polls". Civil.ge. Retrieved 2 June 2015. ^ Saidazimova, Gulnoza (1 July 2005). "Georgia: Opposition Lawmakers Protest Violence Against Demonstrators". Rferl. Retrieved 7 January 2013. ^ GEORGIA PARLIAMENTARY ELECTIONS 21 May 2008 (PDF) (Report). Warsaw: OSCE/ODIHR Election Observation Mission, Final Report. 9 September 2008. Archived from the original (PDF) on 29 October 2008. ^ "Russia, Georgia to repair ties after Saakashvili quits — Medvedev". RIA Novosti. Palo Alto. 24 June 2010. Retrieved 13 August 2010. ^ Corso, Molly (2 March 2012). "Georgia: Tbilisi Building Up Weapons Manufacturing Capabilities" – via EurasiaNet. ^ "Opposition Calls on Diplomats to Monitor Situation in Army". Democrats. 9 June 2009. ^ "Video shows prison abuse". UPI. 19 September 2012. ^ "Unicef condemns prison abuse of minors in Georgia". YAHOO! News India. 21 September 2012. ^ "OHCHR upset over Georgia prison video". UPI. Retrieved 21 September 2012. ^ "OHCHR upset over Georgia prison video". UPI. 21 September 2012. ^ "President Mikheil Saakashvili of the Republic of Georgia to Join Tufts' Fletcher School as Senior Statesman". Tufts University. 20 December 2013. ^ "Саакашвили допросят как свидетеля по десяти уголовным делам". www.forbes.ru. 22 March 2014. ^ "Statement by Jen Psaki: Criminal Charges against Former Georgian President Saakashvili (July 29)". Embassy of the United States, Georgia. 29 July 2014. Archived from the original on 10 August 2014. Retrieved 31 July 2014. ^ Михаилу Саакашвили предъявлено обвинение в растрате бюджетных средств //РБК, 13 August 2014. ^ ntv.ru. "Михаил Саакашвили объявлен в международный розыск". НТВ. Retrieved 5 December 2017. ^ Brenner, Susan W. (2014) Cyberthreats and the Decline of the Nation-State. Routledge. p. 69. ISBN 0415823765. ^ "Saakashvili faces 11 years of imprisonment". NEWS AZ. news.az. 8 August 2017. Retrieved 8 August 2017. ^ "Ukraine Confirms Georgia Asked For Ex-President Saakashvili's Extradition". RadioFreeEurope/RadioLiberty. 5 September 2017. ^ "Saakashvili Convicted Of Abuse Of Power, Sentenced In Absentia". Radio Free Europe/Radio Liberty. 29 June 2018. Retrieved 6 January 2019. ^ "UNM Elects New Chairman, Governing Body". Civil Georgia. 25 March 2019. Retrieved 28 March 2019. ^ Saakashvili, Mikheil (6 March 2014). "Mikheil Saakashvili: The West must not appease Putin". Washingtonpost.com. Retrieved 2 June 2015. ^ "Exile in Brooklyn, With an Eye on Georgia". The New York Times. 19 September 2014. Retrieved 20 September 2014. ^ Указ президента України № 301/2015: Про прийняття до громадянства України Саакашвілі М. як особи, прийняття якої до громадянства України становить державний інтерес для України [Decree of the President of Ukraine № 301/2015: On the acceptance into the Ukrainian community of Mikhail Saakashvili as an individual, the acceptance of which is in the interest of the Ukraine of state interest] (in Ukrainian). President.gov.ua. 29 May 2015. Archived from the original on 2 June 2015. Retrieved 2 June 2015. ^ "Difficulties of ambition. Why young politicians can not agree on a single party". Ukrayinska Pravda (in Ukrainian). 4 July 2016. Retrieved 5 August 2017. ^ "Georgia ex-leader Saakashvili stripped of Ukraine's citizenship". BBC News. BBC News. 27 July 2017. Retrieved 27 July 2017. "Saakashvili May Be Forced To Seek Asylum In United States, Legislator Says". The Financial. The Financial. 27 July 2017. Retrieved 27 July 2017. ^ "Ukraine strips one of its president's rivals of his citizenship". The Economist. 28 July 2017. Retrieved 29 July 2017. ^ Saakashvili, Mikheil (3 August 2017). "The president took my passport away. But I'll keep fighting for a modern Ukraine". Kyiv Post. kyivpost.com. Retrieved 8 August 2017. "Saakashvili says he arrives in Poland from U.S. with Ukrainian passport". Interfax-Ukraine. Kyiv Post. 7 August 2017. Retrieved 8 August 2017. Taładaj, Hubert (7 August 2017). "Były prezydent Gruzji w Polsce – co dalej z Saakaszwilim?". EURACTIV. euractiv.pl. Retrieved 8 August 2017. ^ "Former Georgian President Saakashvili leaves Poland — media". TASS news agency. 8 August 2017. Retrieved 8 August 2017. ^ "Saakashvili claims Ukrainian foreign minister has Russian citizenship". Interfax-Ukraine. 8 August 2017. Retrieved 8 August 2017. ^ "Saakashvili, supporters push past border guards, force entry into Ukraine". France 24. 10 August 2017. Retrieved 10 August 2017. ^ "Former governor Mikheil Saakashvili forces entry to Ukraine". BBC. 10 August 2017. Retrieved 10 August 2017. ^ "Saakashvili Says Hopes To Reenter Politics, Unite Opposition In Ukraine". RadioFreeEurope/RadioLiberty. Retrieved 5 December 2017. ^ "UPDATES: Poroshenko brands Saakashvili criminal for breaking through border – Sep. 11, 2017". 11 September 2017. Retrieved 5 December 2017. ^ User, Super. "Статья 331. Незаконное пересечение государственной границы". Retrieved 5 December 2017. ^ "Саакашвілі та прикордонники оформлюють перетин кордону". BBC Україна. 12 September 2017. Retrieved 12 September 2017. ^ "Saakashvili Rallies Supporters In Western Ukraine, Vows To Help Solve Country's 'Political Crisis'". RadioFreeEurope/RadioLiberty. Retrieved 5 December 2017. ^ "Суд оштрафував Саакашвілі". 22 September 2017. Retrieved 5 December 2017 – via www.bbc.com. ^ "Saakashvili Detained, Home Searched By Ukraine's Security Service". RadioFreeEurope/RadioLiberty. Retrieved 5 December 2017. ^ "Saakashvili detained in Kiev — MP". TASS news agency. Retrieved 5 December 2017. ^ (in Ukrainian) "Саакашвілі помістили до ізолятора тимчасового тримання – Луценко". Ukrayinska Pravda. Retrieved 8 December 2017. ^ "Ukrainian Court Releases Saakashvili From Detention". RadioFreeEurope/RadioLiberty. Retrieved 11 December 2017. ^ Ukraine Bans Saakashvili Until 2021. Rferl.org (21 February 2018). Retrieved on 2018-05-09. ^ Bennetts, Marc (12 February 2018). "Georgia's former president deported from Ukraine to Poland". The Guardian. Retrieved 12 February 2018. ^ "Michail Saaksjvili vestigit zich in Nederland na uitzetting Oekraïne". NOS. 14 February 2018. Retrieved 14 February 2018. ^ მიხეილ სააკაშვილი: თანამდებობის პირის ქონებრივი მდგომარეობის დეკლარაცია [Mikheil Saakashvili: Asset Declaration] (PDF) (in Georgian). Institute for Development of Freedom of Information. 14 May 2011. Archived from the original (PDF) on 26 April 2012. Retrieved 5 December 2011. ^ "Profile: Mikhail Saakashvili". BBC News. 25 January 2004. Retrieved 9 August 2008. ^ Barry, Ellen (2008). "Mikheil Saakashvili". The New York Times. Retrieved 9 August 2008. ^ Murray, Don (29 February 2008). "Can bountiful Georgia escape the Russian bear?". CBC. Archived from the original on 2 May 2008. Retrieved 9 August 2008. ^ Smock, John (13 August 2004). "As prospect of South Ossetian conflict grows, Georgia prepares to send troops to Iraq". EurasiaNet. Archived from the original on 11 May 2008. Retrieved 9 August 2008. ^ Orlov, Alexander Arseniyevich (December 2008). "The Echo of Tskhinval". International Affairs. Minneapolis/Moscow. 54 (6): 68. ISSN 0130-9641. ^ Horowitz, Jason (19 September 2014). "Mikheil Saakashvili, Georgia's Ex-President, Plots Return From Williamsburg, Brooklyn". The New York Times. ISSN 0362-4331. Retrieved 6 April 2019. ^ Levitsky, Steven & Lucan A. Way (2010). Competitive Authoritarianism: Hybrid Regimes After the Cold War. New York: Cambridge University Press. p. 227. ISBN 978-0-521-70915-6. ^ "Country Report on Human Rights Practices in Georgia". US Bureau of Democracy, Human Rights, and Labor. 8 March 2006. Retrieved 1 February 2013. ^ "Human Rights Overview:Georgia". Human Rights Watch. 18 January 2006. Archived from the original on 21 January 2006. ^ "Georgia: International Religious Freedom Report 2005". U.S. Department of State. 2006. Retrieved 2 June 2015. ^ Socor, Vladimir. "Badri Patarkatsishvili: From Russian Businessman to Georgian Presidential Claimant". The Jamestown Foundation: Eurasia Daily Monitor Volume: 4 Issue: 237. 21 December 2007. Retrieved 25 February 2011. ^ "Georgia (2010)". IMDB. Retrieved 21 January 2009. ^ "Movie star plays Georgian leader". BBC News. October 2009. Retrieved 22 October 2009. Savodnik, Peter (January 2009). "Essay: Georgian Roulette: Mikheil Saakashvili beckons from the brink". Harper's Magazine. 318 (1904): 36–42.